There was a point in time when Jake McCabe would find himself on the receiving end of mini stick hockey’s version of a game misconduct. Minor hockey tournament road trips were a norm for the McCabe family, taking them both near and far from their Wisconsin home in Eau Claire. On the occasions that required staying over in the host city or town, Jake couldn’t wait for the puck to drop on the tournaments. Thankfully for the young defenceman, he didn’t have to look very far to satiate his hockey cravings. In fact, all he had to was step outside a door. Hockey wasn’t the only sport McCabe excelled at. And although he wasn’t on the road to Green Bay Packers quarterback Aaron Rodgers-type greatness, he did have some success on the gridiron as a teenager. “As soon as I could walk, I was on skates,” he recalled. “But I played all sports growing up. I was a three-sport athlete in high school until I moved away from home to Ann Arbor (Michigan, to play with the USA Hockey National Team Development Program). I played everything under the sun, so I kept my parents running from one place to the next. When he wasn’t honing his athletic talents, McCabe and his siblings would sometimes help out their father at his construction business. Hard work wasn’t the only lesson he learned. After a successful time with the USA Hockey National Team Development Program, McCabe played three seasons (2011-14) at the University of Wisconsin, drafted 44th overall in 2012 by the Buffalo Sabres. Currently skating in his fourth full NHL campaign, and less than 20 games shy of 250 for his career, McCabe has fond recollections of his days growing up in The Badger State. And what about those mini stick hockey ejections? Before he settled on hockey as his No. 1 sport, the 23-year-old was holding court as a hard-hitting lefty that netted his share of tennis hardware. 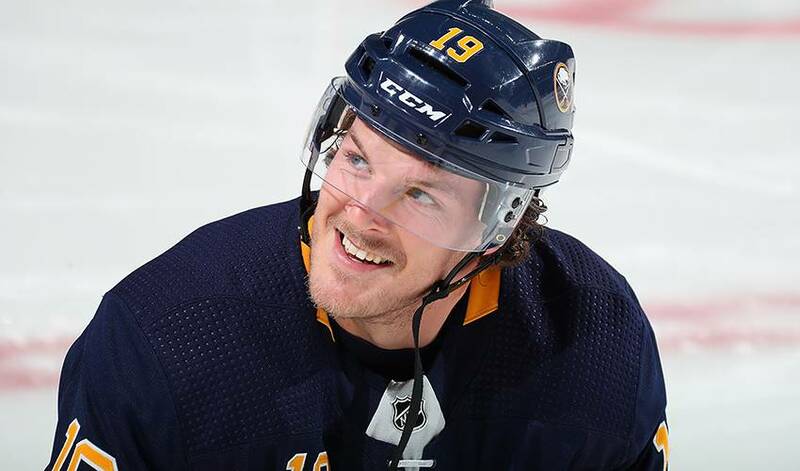 He’s enjoying a starring role between the pipes with the Buffalo Sabres in 2018-19, the 32-year-old’s first campaign tending the twine with the Eastern Conference club.